A Bakken crude oil unit train operating on BNSF’s mainline. Photo courtesy of BNSF Railway. As North American oil production continues to outpace pipeline capacity, shipment by rail is increasingly common. Today, an estimated two-thirds of North Dakota’s crude oil is transported by rail. It’s a big business, with accordingly, big responsibilities. And when incidents happen en route, safety protocols and concerns are brought into focus—and with a little diligence, so too are the associated solutions. Nearly 493,126 tankers of crude moved through North America last year, up from just 9,500 in 2008. And while the overall rate of oil train accidents remains low—stats indicate that 99.9 percent of crude shipments reach their destination safely—industry recognizes there’s still more to be done. Case in point, the BNSF Railway Co. derailment near Heimdal this May marked 2015’s fifth oil-by-rail derailment in Canada/U.S. The Hess Corp.-owned train heading eastbound experienced a derailment of six of its total 109 tank cars (107 loaded with crude oil and two buffer cars loaded with sand). A fire broke out in the derailed cars, while all other cars were pulled away from the scene. BNSF crews and local emergency personnel were quick to respond. A command center was set up near scorched wheat fields adjacent to the train tracks, and crews erected berms to protect nearby wetlands from the blaze. BNSF HAZMAT responders with assistance from local fire fighters extinguished the fires. A total 40 residents were evacuated from the nearby town of Heimdal. No deaths or injuries were reported. Though the Heimdal incident is still under investigation, there is speculation surrounding the train’s model of tanks cars—the unjacketed CPC-1232 models (a model publicly touted by CEO William Furman of railcar manufacturer Greenbrier Companies to be “as dangerous as older cars if they derail and ignite, causing a ripple effect of fire and explosions”). Concerns surrounding this particular model are not new to industry. 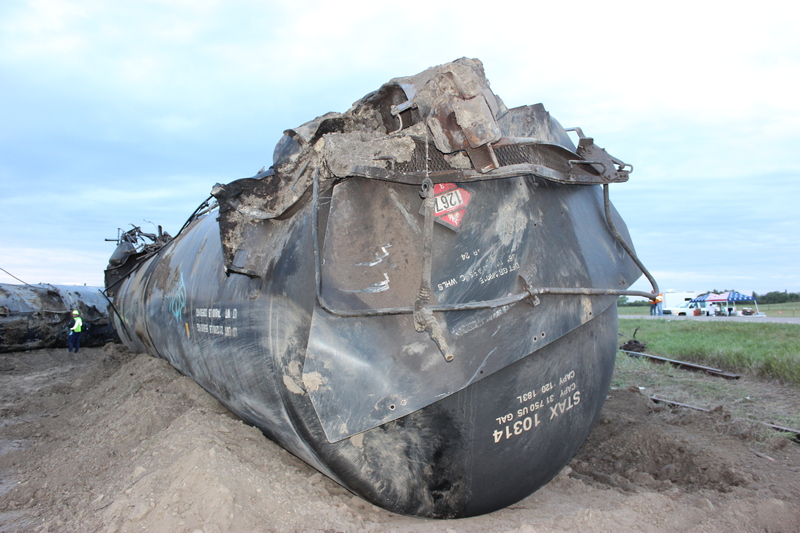 In May, Transport Canada and the U.S. Department of Transportation announced new regulations to improve the safety of volatile shipments, which included phasing out older tank cars, such as the CPC-1232s. The new regulations also involved the addition of electronic braking systems and enforcing speed limits. The development and adoption of a more fortified railcar (the TC-117, as one example), with thicker steel, head shields and protected valves and fittings, is another goal for the plan aimed at reducing the frequency and severity of oil train crashes by 2020. At this time, BNSF reports that it has a broad-based, multi-level risk reduction program, which includes prevention, mitigation and response, to reduce incident risk on the railroad and is designed to ensure that all commodities are handled in a safe and damage-free manner. The company inspects tracks and bridges more often than required by the Federal Railroad Administration (FRA) with most BNSF key routes inspected four times weekly; the busiest inspected daily. 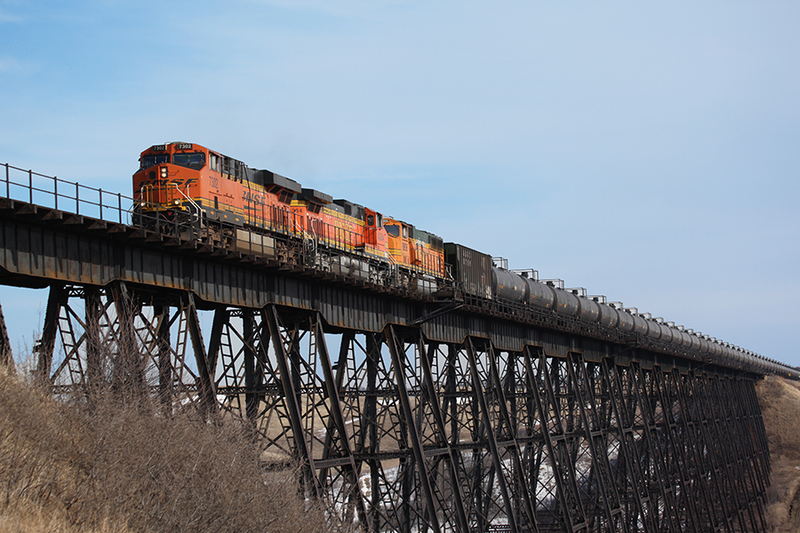 BNSF performs geometry car inspections at least two times on crude oil routes annually. 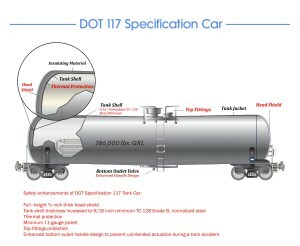 The new DOT-117 tank car standards. Image courtesy of the DOT. Though the Heimdal derailment wasn’t prevented, its impact was mitigated—and for a few very important factors. The removal of select flammable gasses from crude oil, for instance, as required by the state of North Dakota, prevented the fire from escalating to an explosion. Reports confirm that the oil on the Heimdal train was tested at 10.83 psi, about 21 percent lower than the maximum allowed under the state’s new rules. Research on rail accidents has found human error to be a leading cause (i.e. speed, fatigue), while cold weather presents special considerations when the ground opens up in spring (i.e. shifts tracks, rails snap, wheels shatter). The new regulations, as well as existing safety standards and protocol, continue to address and monitor these factors. And thanks to industry’s continued diligence, incidents like the Lac-Mégantic, Quebec, derailment in July 2013—the fourth-deadliest rail accident in Canadian history—are few and far between. (The incident involved an unattended 74-car freight train carrying Bakken crude oil that rolled downhill and derailed, resulting in fire and explosions, a total 47 deaths, and the desecration of the town’s business district.) The incident has since been attributed to a variety of causes: a neglected defective locomotive, maintenance issues, driver error, flawed operating procedures, regulatory oversight, and lack of safety redundancy. With each incident, industry learns and grows with the common goal of safety. Accordingly, high on the priority list is the development of patented new technologies, such as sensors, aimed to proactively warn of defects and trouble spots on crude-by-rail shipments. On July 16, 2015, a train derailed east of Culbertson, Montana, spilling 35,000 gallons of crude oil and forcing the evacuation of 30 people. About 20 cars on the Berkshire-Hathaway-owned BNSF crude oil train went off the rails; there was no fire and no injuries reported. The spilled crude did not reach any waterways. A DOT inspector in the background at the recent tank car derailment in Culbertson, MT. Image courtesy of the DOT. About two-thirds of all North Dakota oil produced is shipped by rail. Why do you suppose rail is a top choice? Is it because of safety reasons? Cost efficiency? DOT spokesperson: The United States is in the midst of an unprecedented increase in domestic energy production. Moving hazardous materials by rail, including crude oil, is not new and the vast majority of rail shipments are safely delivered. What is new is that petroleum crude oil and ethanol are being shipped in larger quantities, over greater distances. DOT is committed to ensuring that crude oil is transported safely and reliably, regardless of the mode of transportation. What are the top safety considerations when transporting oil by rail? Safety is our top priority and DOT has taken more than a dozen actions to minimize risk and strengthen the safe transport of crude oil by rail, including a comprehensive rulemaking and multiple safety advisories and emergency orders. The Enhanced Tank Car Standards and Operational Controls for High-Hazard Flammable Train rule was finalized earlier this year, and it raises the bar on the safety of transporting crude oil by rail. The rule requires stronger tank cars and 21st century electronically controlled pneumatic (ECP) brakes that activate simultaneously on all tank cars, proven technology that reduces the distance and time needed for a train to stop and keeps more tank cars on the track if a train does derail. DOT is committed to making certain that emergency responders have the information they need to prepare for and respond to incidents involving hazardous materials, including crude oil. 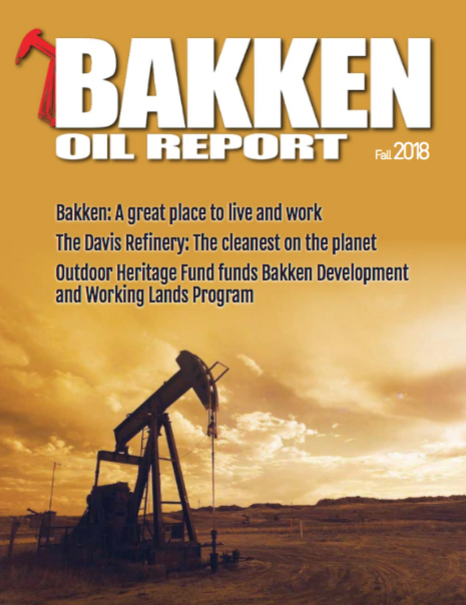 In May 2014, DOT issued an Emergency Order that directed railroads to notify State Emergency Response Commissions (SERCs) and Tribal Emergency Response Commissions (TERCs) of the expected movement of Bakken crude oil trains through individual states and tribal regions. Trains with a million gallons or more of Bakken crude oil – approximately 35 tank cars – are subject to the notification. In May, DOT announced that it will make the notification requirements of the Emergency Order permanent. DOT also recently launched the web-accessible Transportation Rail Incident Preparedness and Response (TRIPR) training for emergency responders, and awards more than $21 million in grants on an annual basis through PHMSA’s Hazardous Materials Emergency Preparedness (HMEP) grant program to states, territories, and tribes to carryout hazardous materials planning and training activities. Also in 2015, PHMSA will award our Assistance for Local Emergency Response Training (ALERT) grant to support hazardous materials training for volunteer emergency responders in rural areas. Earlier this year, Transport Canada and the U.S. Department of Transportation announced new reforms to improve safety of volatile shipments. Could you elaborate on these new reforms? The Enhanced Tank Car Standards and Operational Controls for High-Hazard Flammable Train rule was developed in coordination with Canada and focuses on safety improvements that prevent accidents, mitigate consequences in the event of an accident and support emergency response. Our close collaboration with Canada on new tank car standards is recognition that the trains moving unprecedented amounts of crude by rail are not U.S. or Canadian tank cars – they are part of a North American fleet and a shared safety challenge. Data supporting the Enhanced Tank Car Standards and Operational Controls for High-Hazard Flammable Trains final rulemaking can be found in the Final Regulatory Impact Analysis for this rulemaking available here: http://www.regulations.gov/#!documentDetail;D=PHMSA-2012-0082-3442. [i] The US Department of Transportation’s Pipeline and Hazardous Materials Safety Administration.